Tomatoes. You know what that means - Jon must not be home for dinner tonight! I quartered 2 tomatoes and put them in a baking dish with a few cloves of garlic, salt, and some olive oil. I roasted them in the oven on 400 for 15-20 minutes then removed the skins. I sliced my polenta into 1.5 inch thick pieces and placed them in a baking dish. I then topped each piece with some of the chopped, roasted tomatoes and garlic. I sprinkled each one with some Parmesan cheese and drizzled them with some oil left in the pan from the tomatoes. They went in the oven on 350 for about 5 minutes until heated through. In the meantime I sauteed some spinach in olive oil just enough to wilt it - about 2 minutes. 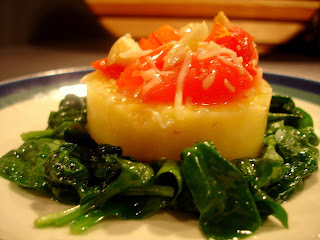 When the polenta was done I put a slice on top of the spinach. They were almost too pretty to eat! If you make your own polenta, transfer it to a flat baking dish once it's done. Let it cool and then use any shape/size cookie cutter to remove pieces. I think these would be a great appetizer for a dinner party. I'd plate each one as I did tonight, and then I'd drizzle some olive oil from the tomatoes around each plate. this looks so fancy and delicious! i've never had polenta but this really makes me want to try it!